AWS Elastic Beanstalk provides a simple, scalable place to host your Ruby, Java, Python, PHP, Java, Node.js, or .NET applications in the AWS cloud. But how do you get your application code to Elastic Beanstalk? In addition to simplicity and scalability, Elastic Beanstalk provides several flexible mechanisms to upload your code, including git, Eclipse, Visual Studio, and uploading an archive via the API or Management Console. Today’s blog post focuses on how to properly package and upload your app to Elastic Beanstalk. Elastic Beanstalk expects your application upload to be formatted as a ZIP file (or WAR if you’re deploying a Java application.) Additionally, your application code should be at the top level of the archive, as opposed to being nested within a folder (i.e., when you unzip the archive, the files shouldn’t be nested in a top-level directory). 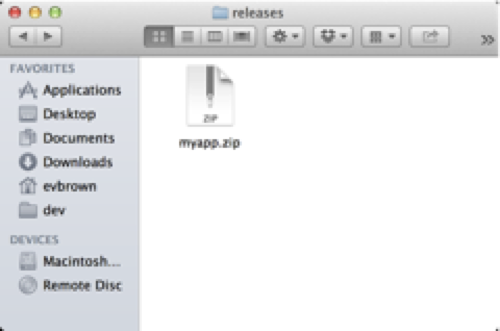 ~/dev/myapp$ zip -r ~/dev/releases/myapp.zip . If you happen to use Git to version control your application source, you’re in luck! Git provides a simple mechanism to create archives that work with Elastic Beanstalk via the aptly-named archive command. Whatever tool you use, just remember: if you’re creating ZIP files of your app to deploy to Elastic Beanstalk, be sure the files are at the top level of the archive and not inside a parent folder. As we saw, you can do this using the zip CLI, in Finder or Windows Explorer, or even with Git. And don’t forget, if you’re using eb, the AWS Tookit for Eclipse, and the AWS Toolkit for Visual Studio to deploy your applications, it’s all taken care of for you.